Home > Timesheets > Timesheets - FAQs > How Do I Add Un-invoiced Time to an Invoice? If you’ve already configured project settings and tracked time on billable categories then you can add those un-invoiced timesheet entries to an invoice. From the main menu select Invoices > Invoices and click the ‘Create Invoice’ button. You can filter the customer drop-down to only display customers with un-invoiced time by clicking the checkbox labeled “Only Display Customers with Un-invoiced Timesheets, Expenses or task Fixed Amounts”. On the Create Invoice page, you will notice the “Add Time” button as per the screenshot below. This will display the Add Time popup. Please note this feature is also available when editing an existing invoice. On the “Add Time” Pop-up, you can apply a few filters and choose how timesheets should be grouped. 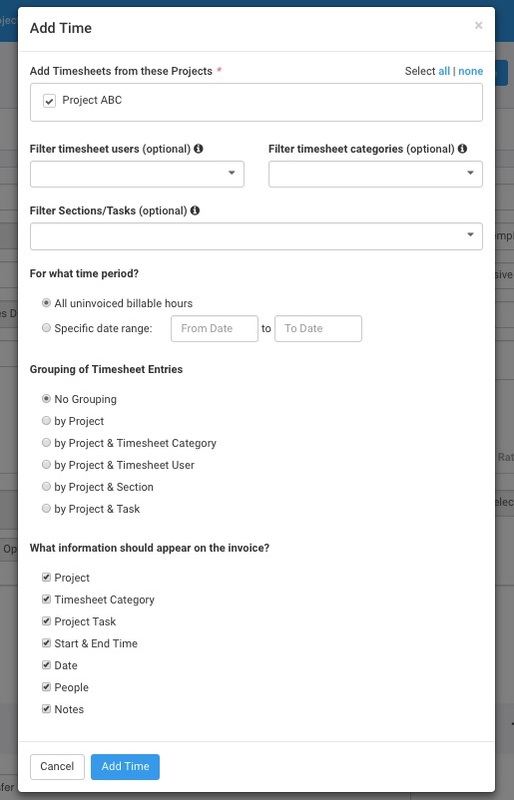 Filter timesheet entries by one or more Projects, Timesheet Users, Timesheet Categories, Sections, Tasks and Date Range. You can choose to group your timesheet entries by Project, Project & Category, Project & Timesheet User, Project & User, Project & Task or No Grouping. For example, Grouping by Project will add a single invoice line item for all timesheets belonging to a particular project. If you select No Grouping then you can choose what timesheet fields should be displayed on the invoice line item description field. You can choose Project, Timesheet Category, Project Task, Start & End Time, Date, People and Notes. Click “Add Time” and the Invoice will now include the filtered un-invoiced timesheet entries. Unable to add time to an Invoice? Here are some reasons why. Need more help? Read through our Getting Started with Timesheets and Getting Started with Invoices guides, or contact our support team via chat or email (support@avaza.com).